The first flight of the Russian Soyuz rocket from South America will occur in early 2011 and Europe's smaller solid-fueled launcher will not debut until at least the middle of next year, according to Arianespace's chief executive. Speaking to Spaceflight Now last week, the launch services firm's top manager said the Soyuz launch pad at the Guiana Space Center has been finished after several delays in the construction of a mobile gantry. "The Soyuz in French Guiana and the launch pad are now undergoing tests," said Jean-Yves Le Gall, Arianespace chairman and CEO. "We have the first two launch vehicles in French Guiana, and we are now preparing fit checks with the launch vehicle and the launch pad next year." The 17-story structure will house the Soyuz rocket during the final steps of launch processing, including the attachment of satellite payloads atop the booster. Soyuz launch facilities in Kazakhstan and Russia do not use a mobile gantry. Instead, the rockets are fully assembled horizontally and rolled to the launch pad a few days before liftoff. "The payload for the first launch will be either the Pleiades satellite for CNES, the French space agency, or the first (validation) Galileo satellites for the European Space Agency, and we will decide this fall," Le Gall said. The Soyuz was scheduled to launch in December with the HYLAS 1 satellite for Avanti Communications of the United Kingdom. When it became clear the Soyuz would not be ready to fly by the end of the year, Arianespace moved the Ka-band communications satellite to an Ariane 5 launch in late November, when it will be orbited with the Intelsat 17 spacecraft. Le Gall said the first Soyuz will go the launch complex at the beginning of 2011. "I think we will have the first launch vehicle mated on the launch pad early next year, and after that we will proceed with the first launch," Le Gall said. 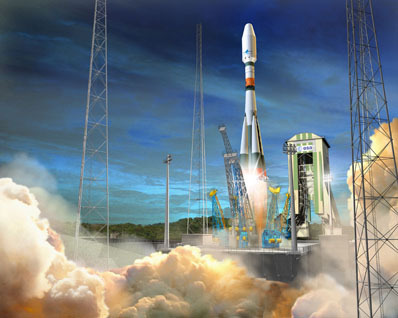 The Vega rocket, tailored for small European government satellites, will launch after the Soyuz sometime in the middle of 2011, according to Le Gall. "We are at the end of development, which means we are beginning a number of tests on the launch pad in French Guiana, a new launch pad built on the former launch pad of the Ariane 1," Le Gall said. "We are going to continue the tests for the next nine months in order to perform the first launch by mid-2011." The first Vega mission will haul several lightweight satellites into orbit, including a laser relativity spacecraft and a handful of smaller payloads. Arianespace and the European Space Agency last week signed a work order for the first Vega rocket after the inaugural launch in mid-2011. 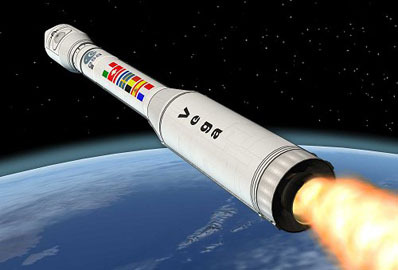 The launch firm and the rocket's Italian prime contractor also agreed on a framework contract for the Vega Research and Technology Accompaniment program covering the first five missions after the qualification flight. "This is a very important milestone because, in my opinion, we triggered the beginning of production of Vega," Le Gall said. No payloads have been assigned to the next batch of Vega launches. "These are just the contracts for the procurement of the launch vehicles," Le Gall said. "The contracts for the payloads will be announced in the coming months." The Vega's P80 first stage has been manufactured and loaded with solid propellant in French Guiana. The rocket's upper stages assembled in Italy are awaiting shipment to the launch site. The addition of Soyuz and Vega to the Arianespace family will give the company a foothold in all sectors of the launch industry.